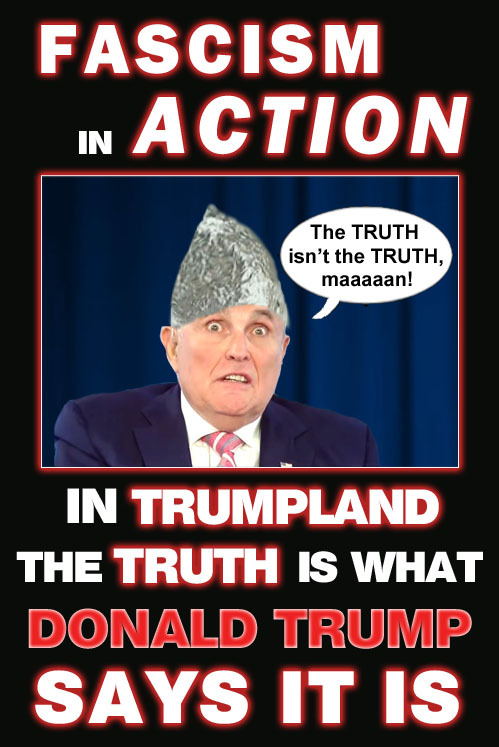 So what exactly is the truth to Giuliani or any cowardly, feckless Republican these days. Since the GOP has gone into full fascist mode, we’re guessing that the truth is anything America’s CEO/Dictator Donald Trump, a.k.a. Dear Leader, says it is. To cowardly, feckless Republicans, the truth is what America’s CEO/Dictator, Donald Trump, a.k.a. Dear Leader, says it is. Former Trump advisor, lackey and puppet, Omarosa Manigault Newman has captured the attention of the nation this past week with the release of her new book and tapes of the many lies told by the many liars who reside in the Trump administration. While we’re enjoying the barrage of leaks about this disastrous presidency, we’re also incredibly skeptical of Omarosa’s statements. Let’s be clear here – she’s a self-aggrandizing, obnoxious, mendacious, attention whore just like everyone else in the Trump White House including the orange haired man child. When she claims that Trump was eating paper like a spy out of espionage thriller… well… we have our doubts. Especially when she was such a colossal sycophant to Trump while she worked in the White House and praised him on the 2016 campaign trail. Of course, now that Omarosa has switched teams, Trump, who once praised her, now vilifies her and has sicked his minions to attack her. Which brings us to Kellyanne Conway, Trump’s Queen of Alternative Facts, who recently emerged from her liars lair to spin lies and deception to protect Trump. Last week Conway denied that Trump was racist but yet had a hard time naming any staff members who were African-American. Omarosa’s leaked tapes seemed to have nullified this particular claim. This week, Conway’s domestic troubles with her husband, who is strongly anti-Trump, have surfaced. Every time Conway opens her mouth, lies spew forth like a geyser of misinformation. We’ve noticed that Trump’s puppet of alternative facts bears a striking resemblance to another puppet: from the 1970s, Wayland Flowers’ Madame. Slap a turban on Conway’s head and load up the blue eye shadow and … Voila! We just wish Conway was as enjoyable as Madame was. 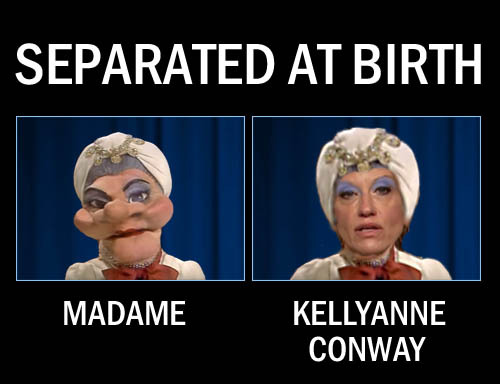 The Queen of Alternative Facts, Donald Trump’s principal prevaricator puppet, Kellyanne Conway, bears a striking resemblance to Wayland Flower’s beloved puppet from the 1970s, Madame. 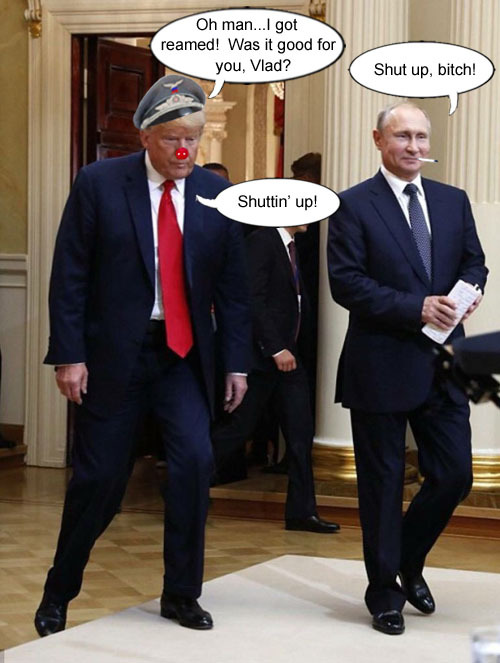 We’re still astonished that forty percent of Americans are still supporting America’s CEO/Dictator, Donald Trump, even after he’s admitted to collusion with Russia and practically knelt down and licked Vladimir Putin’s shoes during their summit in Helsinki. Of course, over the course of the last three years there have been many moments when Trump did or said something so incredibly insipid, stupid or ridiculous that any sane person would have thought surely people would abandon him. 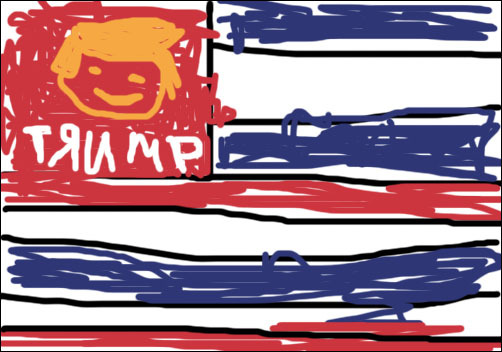 But not only are his base supporters applauding him, (Trump supporters are even wearing “I’d rather be a Russian than a Democrat” t-shirts) but the Republicans are doing nothing to reprimand him or reign him in thus indicating they are fine with Russia intervening in our elections, especially if it keeps Republicans in power. Can you imagine the outrage if decent Republican presidents of the past like Eisenhower or Reagan had done what Trump has done? What if Eisenhower had said he didn’t trust the CIA and invited Krushchev to put missiles anywhere he wanted? 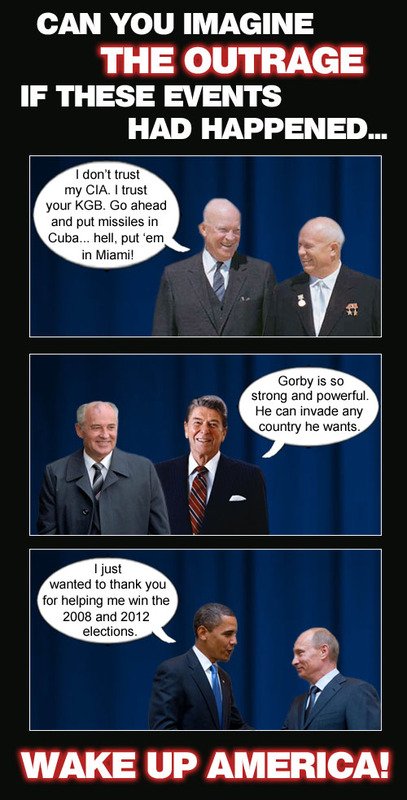 What if Reagan (who called the Soviet Union the evil empire) fawned over Gorbachev, calling him ‘strong and powerful’? Can you imagine the outrage if Obama had asked Putin to help him win his elections? We’re living in a time where the supposedly ‘moral and righteous’ Republican party is anything but. The Republicans are nothing but feckless, mendacious hypocrites who revel at putting party above country, truth and justice. At least it seems with recent primary elections that some Americans are finally waking up to the GOP’s treachery. Just this week, the Ohio congressional seat special election in district 12 is still too close to call and this district is about as red as you can get. We have one thing to say to Trump supporters or people on the fence about our orange haired, man child president: Wake Up! Modern day Republicans conveniently look away from Trump’s outrageous actions that would have gotten previous presidents universal condemnation. We’re still flabbergasted by Donald Trump’s performance at his summit with Vladimir Putin in Helsinki a few weeks ago. We’ve never seen such a shameful display by a United States president. Many others, including Republicans agree with us. Dubya came close when he got all romantic about looking into Putin’s eyes and seeing into his soul, ”I looked the man in the eye. I found him to be very straightforward and trustworthy. We had a very good dialogue. I was able to get a sense of his soul.” But Trump’s actions boggle the mind. And all pictures and videos seem to back this up. There are very few pictures from the Helsinki summit where the normally glum Putin, isn’t smiling, like this pic from after Trump’s secret meeting with Putin. Oh yeah… Trump really looks like he’s laying down the law to Putin. Russia must really have something good on Trump… just sayin’. America’s CEO/Dictator, Donald Trump, boldly lays down the law with Russian president, Vladimir Putin.